"Scott blends unbelievable MIND READING, intelligent HUMOR, and captivating CHARM into AN UNFORGETTABLE ENTERTAINMENT EXPERIENCE." 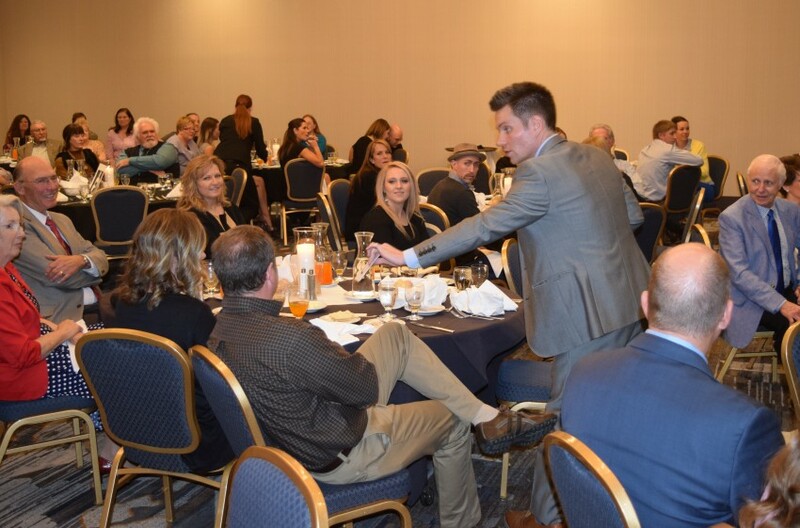 Using a variety of techniques from psychology, hypnosis, and neuroscience Scott pulls thoughts out of your guests minds, influences their decisions, and messes with their senses of reality. 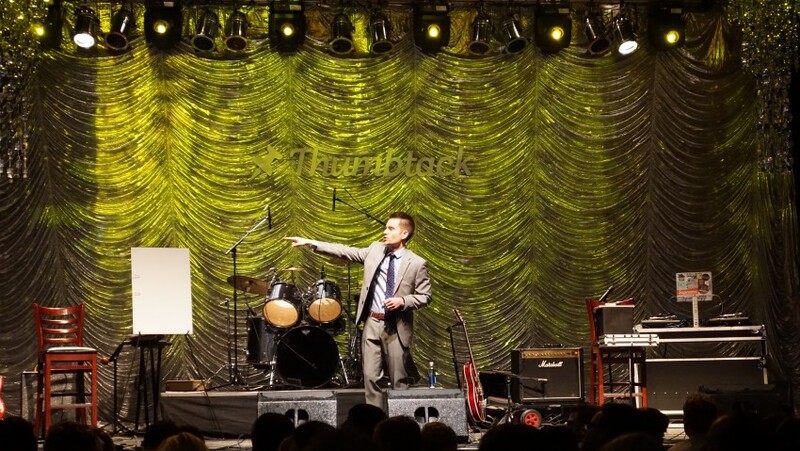 He's one of the only performers of his kind that offers a 100% Money Back Guarantee and has years of experience to ensure that you have NOTHING to worry about as the event planner. Scott has shared his talents with thousands of people from large corporations to intimate private parties throughout the United States and looks forward to making your next event UNFORGETTABLE! I was encouraged by a former co-worker to hire Scott for a company event. We booked him for our end of year celebration and could not have been happier! Scott was super easy to work with from beginning to end and exceeded our expectations! It was incredible! Employees minds were blown away by his show and still talk about how "things" happened! To say there was a favorite part would be lying as the entire show was amazing! We had a goal this year to provide our employees with the best event they have been to in years if not ever and having Scott there to perform definitely helped us achieve that goal! We would easily bring him back in the future to do another show! If I could give higher than a 5 star I would. One of the best shows and forms of entertainment I have seen! Scott Andrews was a delight to work with from the moment we spoke on the phone all the way through the end of my event! He exudes professionalism, and delivers exactly what he promises. I found Scott through a Google search, just looking for local entertainment in Utah, and I was so lucky to stumble upon his GigSalad page. I was sucked in from the second I saw the trailer. I knew I had to have him for my event! I submitted my request, and I heard from Scott the same day. At our corporate events, we usually shy away from outside entertainment, but we are so glad we tried to do something new this year and Scott did not let us down! I would definitely recommend Scott Andrews for any kind of corporate event, party, gala or even if you need a host for your event. He offers an array of services, and he definitely didn’t let me down. I was also surprised by the fee he charged as it was excellent for the entertainment provided. Scott was very good at including members of the audience, using their participation, and also wowing us every step of the way. He kept everyone’s interest the entire set. I would definitely use him again in the future! I truly appreciate your kind remarks April - you and your team were a DELIGHT to work with! Everything from the gorgeous venue to your charismatic guests made it a performance I’ll fondly remember for years to come! Thanks again for inviting me to part of Zurixx’s holiday gala! Scott's Performance is truly Mind Blowing!!! I have never been so extremely pleased with a decision to hire someone in my life until I hired Scott for our company party! From the beginning, he was so great to work with, super cooperative and genuinely cared. His performance at our Holiday Party was better than I could have ever expected. He was so entertaining, funny, and everything he did was seriously jaw-dropping. He stayed after his performance to mingle with our guests and perform smaller tricks which everyone loved. Since our party, I have received non-stop compliments about how great the party was, especially the show. I am so proud and pleased with the decision to hire Scott, and would recommend him to ANYONE! (Also, his "Prediction Box Finale" is A MUST, seriously incredible). You know how to throw a party Gina! I had an incredible time and I'm humbled to hear that you were so satisfied with the show! Happy holidays! Scott's show is a MUST SEE! Scott put on a fantastic show! From the day he came into my office, Scott was great to work with. I was sold the second he showed me what he does, I was mind blown. We hired him for our Year End Celebration and we were very satisfied. Monday morning everyone was talking about how awesome he was! It was great to see so many associates excited and happy with the show. Looking at other entertainment opportunities he was right in line if not less than others. I highly recommend Scott. He is professional, on time and polite. So happy to hear that you've received positive feedback from your associates Chelsey! It was GREAT to work with you and Scheels for your year end celebration - and holding the event at the Loveland Living Planet Aquarium was incredible! Having sharks swimming behind me as a backdrop to the show was definitely a first for me! Scott was great. Everyone love the entertainment. Scott is very talented. Was something new for entertainment and well worth it. Everyone enjoyed his talent. We worked with Scott on a high level corporate dinner. He was VERY engaging with our clients and provided thought provoking entertainment. We highly recommend his services! It was mental! Just astounding! Scott was incredible! I loved the show! Scott was very funny and but on a very entertaining show! I throughly enjoyed your performance. Would recommend it to anyone and I myself would go again. From the moment Scott and I spoke on the phone about my event, I knew he was the perfect fit. Scott took the time to get to know a little about our event, his audience, and what our organization is all about and he worked it in to his performance. Scott is extremely conscientious of returning phone calls and emails in a timely manner. His price is reasonable and customary. Now, to his performance! Scott performed to our crowd of less than 100 and we ranged in age from 16 to 60, but 90% of the crowd was 16-21. Scott had us all hooked from the word go. How can I explain this, he is not a hypnotist or a magician, he's more of a mind-reading, psychic, illusionist with a cerebral kick at every turn. Our crowd enjoyed Scott, immensely and I recommend him, highly. On a personal note (as I know he will read this), thank you, so very much, Scott, for giving us the perfect end to our great day of competition. Scott was great to work with from beginning to end. He didn't hesitate to craft his show to fit our needs. He provided both small group interactions as well as a large-stage performance at our event - and he was excellent in both venues! He is engaging, entertaining, and mind-boggling all at once. His professionalism set the tone for our event, and his ability to provide a variety of interactions left our guests fully entertained the whole evening. Thank you Scott! We will recommend you at every chance we get! Scott added so much to our charity gala. He entertained guests in small groups on the floor and was a highlight of our stage show later in the evening. Our guests absolutely loved Scott's show. He is so engaging and entertaining. He was quick to respond to emails while arranging the event and was very professional. I highly recommend Scott Andrews! Scott was nothing short of amazing! Not only is he an unbelievable illusionist, he connected with the audience in a meaningful way and he is an outstanding individual. He far exceeded my expectations in his performance, professionalism, and ease to work with. I just can’t wait to see him perform again, I’m hooked! Scott Andrews was a phenomenal performer, and provided entertainment perfect for our event. He was interactive, exciting, and MIND BLOWING. His performance has it all – suspense, mind-blowing & funny! Our radio station decided to throw a birthday bash to celebrate 20 years of broadcasting. We knew we could bring the crowd and the music, but what's the main event? Scott Andrews! His performance, style and humor was the perfect compliment to our radio station music and audience. It was a great evening of entertainment. Our listeners were thrilled ... WE were thrilled! Thank you! I had a great time as well Ryan - you and everyone else there at the station were a delight to work with! I wish you all another 20 years of success on the air! It’s no secret this guy is amazing!! This was by far one of the coolest shows I have see . We booked Scott for a high school party and it was beyond what I even imagined. Everyone was blown away! We will be using him again and again! Awesome night! We LOVED Scott! Scott was great to work with from the very beginning. I felt the price was right for the whole night of entertainment. Scott really captivated our crowd the whole night, I am confident in saying the whole crowd was spellbound from the very beginning. Our employees are still talking about Scott and "how he did it" and "that was the best night ever"
Thank you Scott for a wonderful show! Scott was easy to work with and so much fun. every person at the event was laughing and completely amazed. would highly recommend for any event!!! Over 60 people completely entertained for nearly an hour! That is saying a lot considering the business we are in is entertainment. Sometimes we can be difficult to impress! Would highly recommend Scott for any group setting. YOU will not be disappointed. Do something different and book Scott to entertain! Scott was so much fun! I hired him for my birthday party to entertain family and friends. You can tell he's very experienced and adaptable to any crowd. He had us captivated the whole time and everyone left energized and impressed. He's professional, personable, and truly interested in making sure everyone has a good time. There are several mentalists in town, but I chose Scott because of how kind and personable he was from our first email interaction. It was clear how much he wanted to make the evening a success. I had a lot of fun as well Laura! I'm humbled to hear that you had such a positive experience with me and that you and your guests had such a great time! It was my pleasure to help you celebrate your big day! Scott was great to work with from the very beginning. We were first time clients and he met with us to give us a taste of his show. We were mind blown from the get go! Very professional, very accommodating, worked through all the details very smoothly. Receives a high recommendation to do a repeat performance with us. Thanks Sonia! You did a wonderful job coordinating the many elements of an excellent party for Janey Lou's! Happy holidays! Without hesitation Scott is five out of five stars! Scott was easy and pleasant to work with from our initial contact through the night of the event. He was quick to respond to our questions and understood that we need to make our event a success. Scott’s show exceeded our expectations and we are still trying to figure out his performance. He had us laughing one second and then amazed in the next second with his mindreading abilities. I have had several employees’ state that he was the best entertainment that we have ever had at our hospital holiday party. Our favorite part of the show was the ending and how he tied all of his “tricks” together into a huge finally that did not disappoint. Without hesitation Scott is five out of five stars! Thanks Liz! I had a blast contributing to your holiday party. You too were excellent to work with during the planning stages of the event - so thank YOU for all of YOUR efforts as well! We hired Scott Andrews for our annual Christmas party at Gunnison Valley Hospital this year. In years past we have had a few entertainment acts that were not all that great. This was not the case with Scott Andrews. He did a phenomenal job. We had about 250 people, and he easily kept the attention of the whole group. I loved how he used people out of the audience, as it added to the entertainment aspect and kept people involved. His price was very comparable to others that I priced out. I have had many people tell me "it was the best entertainment EVER"!! I really appreciated his professionalism through conversing for over a couple months. He was FANTASTIC. I highly recommend him!!! Thank you so much Arien for the kind words! I'm extremely happy to hear that you've received such positive feedback from your guests. It was a pleasure to help make your holiday festivities a bit more memorable there in Gunnison! Having Scott at the wedding was such an awesome part of the overall experience I wanted my guests to have! I have guests that commented on how fun and unique that was to have an illusionist at a wedding, they had never been to a wedding that had that type of entertainment. Which was precisely what I wanted, a unique wedding experince not the same routine boring wedding. So Scott definitely met my expectations. I only wish I would've had more time at the wedding for myself and my now husband to have watched him perform at least one trick. But Scott is so awesome that he's offered to come to a family party or get together to do a small performance since there wasn't enough time at the wedding. That's just awesome customer service! He was great from the first time I met him to "interview" him and see if he'd be a gold fit for my wedding, which is where he first really impressed me with his amazing tricks and how easily he interacted with me and my couple of friends that came along. And of course through the wedding and now after the wedding. I would highly recommend him for any event! Scott Andrews is an amazing entertainer. His performance was fantastic! He kept the audience engaged and entertained throughout the entire show. I received many complements and thanks from those that attended for bringing in this great show for our event. Scott was great to work with throughout the entire process. He came prepared and put on an excellent show. If you're looking to entertain any size group I strongly recommend Scott. Thanks for the kind words Brian! It was great to participate in the IT Conference for Western Governor's University - you've got a fun group of colleagues and I thoroughly enjoyed my hour on stage! One of my primary goals is to make you (the event organizer) look GREAT in front of your coworkers and I'm pleased to hear that you're receiving compliments and accolades off the back of my contribution to the conference! Scott's performance at our team member celebration was phenomenal. He incorporated a personalized corporate message (our company motto) into the finally that left everyone saying "how did he do that!" He was fantastic to work with from the time I requested a quote to the time he was at our event; well worth the price! His skills are truly unique and he is an exceptional entertainer. You were amazing to work with Jessica! 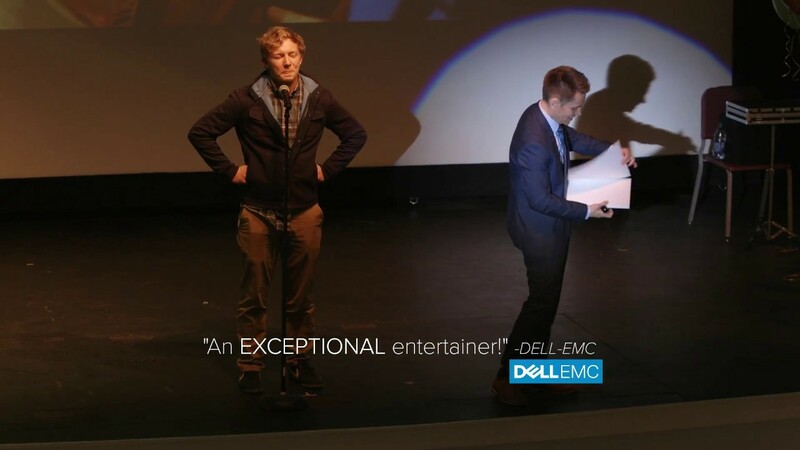 Thanks again for inviting me to participate in Dell-EMC's grand opening event! I really enjoyed my time with your guests and I'm very pleased to hear that the show was so well received. Let's keep in touch for future events! Your show was AWESOME! We really enjoyed it and it totally met our expectations. The mix/mingle during the dinner hour, followed by the 50 minute show, was a perfect time allotment. The fact that almost the entire group stayed for the whole night, was definitely a good sign that they were fully entertained. The fee you charged was appropriate, you were extremely easy to work with and we will definitely keep you mind for any future events. I don’t know how you do it, but that was amazing! Thanks Becky - I had a GREAT time at the E-Automate User Group Conference! You have a fun group and I thoroughly enjoyed my interaction with them during the mix-and-mingle and stage show. I look forward to working with you again soon! This Guy Blew My Mind and He Probably Already Knows it! So I was another Vendor at a recent event Scott did, and me and my fellow operator were so enamored with his show we had a hard time focusing on our job we were hired to do! Luckily so was everyone else, so we were able to see most of his performance. I'm not sure what he charges, but If you are looking for a great large group entertainer, he is definitely your man! Scott was excellent to work with and very entertaining. We made a great choice going with Scott for our two nights of entertainment! Our audience enjoyed his thought provoking interactive entertainment, and are still wondering how does he do it. Overall Scott is very personable, professional, prepared, and easy to work. Thanks again Shelley, and everyone else on your team, for the opportunity to join you all for a few days! I really enjoyed my time there in Gillette and will retain fond memories of working with you and performing for your guests! Jaw dropping entertainment. Book him now! Remarkable entertainment that will be talked about for years. Not only was he exceptional to watch, he was delightful to work with. While being both professional and flexible, he went the extra mile to make certain all our hopes and expectations were met. A rare find in the entertainment world of today. Thanks so much Julie for inviting me to participate in the evening! You all were such a fun group and the true stars of the show! Fantastic! Scott Exceeded All Our Expectations!! For weeks after our event our employee's were still taking about how amazing Scott's show was and still trying to figure out "How did he do that?" I have told family and friends who work for big companies that they need to book Scott for an event. I loved that so many of our employees were involved in the actual show, so no one got bored ( how could you?) because so many were participating. Great, great job!! We had the pleasure of having Scott entertain for our Corporate Christmas party. Not only was he a delight to work with, but he put on the most magnificent show! We kind of through a curve ball at him and he worked with it in the most professional manner possible. He got everyone in the audience involved, and we look forward to having him again in the future! Scott did such an amazing job. My coworkers have been talking about it all morning and keep talking about how there minds were blown. Scott is also so easy to work with. Thank you again Scott for such a fun night. Scott was so professional from our first contact all the way to the party I knew I could count on him. He tailored his performance perfectly to our event and our guests couldn't get enough! His skills are unbelieveably good. I highly recommended him for any event. Thank you for the kind words Jessica! I too had a fantastic time. You and your guests were the real stars of the evening! I look forward to working with you again - have a wonderful holiday season! Scott Andrews was AMAZING!! Everybody in the room was blown away by the unexpected. For days after the party, I kept getting feedback about how great Scott was during his performance and how we need to book him again. Jokingly, we all talked about who's birthday is next week so we can book him right now!! During his performance, you think to yourself, "There's no way he will be able to pull this off!" And then it just happens...and all you can do is drop your jaw and say "WOW!" I would HIGHLY recommend Scott Andrews to anyone and everyone. Scott was a delight to work with!!! He was more than quick to respond and was very thorough in communicating with me on the details for our event. He provided the show that was asked for and went above and beyond to make the event a success. His prices are reasonable for the intended entertainment that we were needing as well. The crowd responded very well to him during the mingle and greet and his mini performance had the audience guessing. I would be more than happy to have Scott back for future events, as he was a pleasure to work with and was more than willing to accommodate any of our needs. I am getting tons of compliments on Scott's performance last night at our Holiday Party. Everyone was very impressed with his show and I highly recommend him. This was one of the best, if not the best, holiday party I have executed in 20 years. We hired Scott to perform for a group of roughly 80 people. Scott came well prepared and ready to entertain. Some shy members of the audience were hesitant at first because of the audience participation the show requires, but soon everyone was laughing and having an great time. The act itself was incredible! Having been the person to hire Scott, I had many people approach me after the event to let me know how much they enjoyed it. I heard many "How is that possible?" type comments. I asked that myself. Needless to say, we would definitely hire Scott again! We are already talking about having him back! Scott's performance was a great ending to a great day. He was very easy to work with throughout the entire process and was on top of all the details which helped me not to worry about them. To top it off, his fee was a steal for the quality of entertainment he brought to the event! I'll admit, because the show involves so much participation, I was a little nervous about how it would be received by those in attendance but once people started laughing and getting into it that all went away. I could tell everyone really enjoyed the evening. I've heard nothing but good things this morning! Everyone enjoyed your show! I've heard nothing but good things this morning! It was very interesting and fun! You were AMAZING to work with from beginning to end and absolutely met my expectations for the evening. We will definitely look at having you back in the future! That was by FAR the most fun we've EVER had! "I'm absolutely speechless . . . how was that possible?!" "That was by far the most fun I've ever had at a company party!" "Your show was incredible! You'd be dangerous in the courtroom!" Randomly selected members of the audience use their intuition to amazingly identify the numbers printed on a lottery ticket they've NEVER seen. Scott demonstrates and teaches lie detection techniques you can start using tomorrow - he then takes things EVEN FURTHER to recreate a drawing that merely exists in someone's mind. Several people from the audience GENUINELY cause an object in their hands to move using NOTHING more than the power of their minds. Scott plays the ultimate game of hide-and-seek by reading the minds of half a dozen people merely thinking about where they'd like to hide - ANYWHERE IN THE WORLD. Two minds become miraculously connected and share the same thought - despite the fact that one person is MILES AWAY on the other end of a phone! And a finale that's difficult to believe even when you experience it for yourself! AND THAT'S JUST SCOTT'S STAGE SHOW! Now imagine the impact he'll have as he gets up-close and personal with your guests. He'll pluck names, dates, and memories from their minds; he'll influence their decisions in the subtlest of ways; above all, he'll create LASTING memories! As a young child Scott fell in love with J. M. Berrie's enchanting tale, Peter Pan. He enjoyed reading about daring adventures, pixie dust, flying, lost boys who never aged, and especially Neverland - a place where anything is possible as long as you use your imagination. For far too long Scott not only believed that human flight was possible but also that he looked good in tights as he donned his "Pan-man" costume year after year for Halloween (and . . . other occasions). At eight years of age, Scott witnessed a performance by the famed magician David Copperfield in which David flew about the stage as effortlessly as Scott imagined Peter Pan would. From that moment forward Scott became fascinated with magic and illusion. He studied every book he could get his hands on that promised to shed light on the mysteries that he yearned to learn. He devoted hours upon hours mastering sleight of hand with playing cards and coins in hopes to pass on to others the feeling of wonder that he felt years before as child reading about Neverland. In his late teens, Scott realized that the "magic" he worked so hard to create truly didn't happen in his hands but rather in the minds of those for whom he performed. He recognized an opportunity to go straight to the source of all magic and mystery - the human mind - and in so doing stumbled across a set of techniques that were more magical, unnerving, exciting, and fun than he ever realized existed. It's at this point that Scott began to spend less time learning magic "tricks" and instead focused on understanding the principles behind PSYCHOLOGY, SOCIOLOGY, HYPNOSIS, and NEUROSCIENCE. That being said, Scott is the first to admit that he still relies on his background in magic to push his demonstrations past what would otherwise be possible. Since that time Scott has gone on to obtain a degree in Finance from the acclaimed Marriott School of Business at Brigham Young University, secure a position as the Human Resources Manager for a national advocacy group, and start a family along side his best friend, and wife, Stephanie. Now, drawing on his academic and vocational experience as well as his eclectic interests ranging from painting to riddles, Scott is able to craft memorable messages and unforgettable mysteries for ANY occasion. He has shared his talents with thousands of people from large corporations to intimate private parties throughout the United States and looks forward to being part of your next event! Staging: Scott's stage show requires a minimum performance area of 8 feet deep by 12 feet wide. If you anticipate more than 50 people to attend then a raised platform (with suitable stair access) is recommended to ensure that even those in the back have a clear view of the performance. The stage should be furnished with 4 sturdy chairs. Lighting: No special lighting effects/equipment are required. Scott merely asks that the performance space be well lit so as to remain clearly visible. Sound: For groups larger than 80 people a professional sound system is required. Please provide one lapel (tie clip) microphone AND at least one hand-held microphone WITH stand. Room Configuration: The room merely needs to be arranged such that everyone has a clear view of the stage. Please refrain from seating guests to the extreme right or left of the performance area as their views will be quite limited.